These are the skeletal remains of an aurochs (Bos primigenius), a now extinct species of cattle from which nearly all species of domestic cattle are descended. The remains include the pelvis, a few ribs and part of the backbone and are thought to be from a bull. The bones show that the animal had suffered a series of injuries in its life, including a fracture to its pelvis that would have caused it to limp and three ribs showing healed fractures. There are also signs of an infection around one of these rib fractures that may have led to the animal's death. The bones have been Radiocarbon dated to 1738-1450 BC, during the Bronze Age period. It was exposed by erosion on Porlock Beach in October 1996 and later recovered through excavation work. The skeleton may represent one of the last examples of this species in Britain. You can view further information about the skeleton in the monument record for the Aurochs. 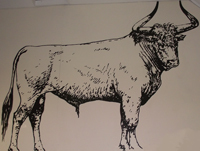 The aurochs skeleton is on display at Porlock Visitor Centre, which also presents a full size outline illustration of how the aurochs may have looked, drawn by the West Somerset Community College's art department (see image).